So maybe there is some canine ambiguity here. Still, whatever it is these dogs are watching, you get the feeling that something is going on. And here is another thing. 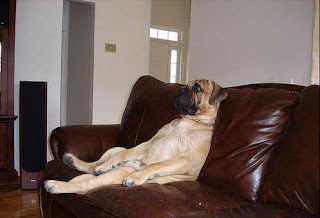 It is possible that some dogs do more than just watch TV, they’re watching too much, becoming glued to the tube. They are aided in this by their humans, who believe that TV watching provides pleasurable stimulation or alleviates separation anxiety. 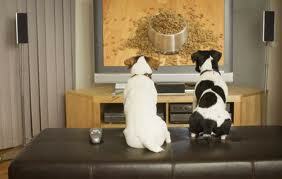 And then the website families.com pinpoints a particular gap in TV-watching dogs’ sensory environment. 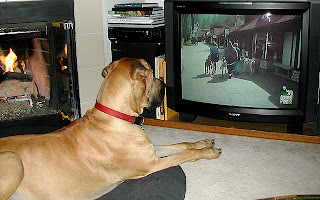 An article by Aimee Amodio asserts that the problem with “vegging out and watching TV for hours” is that dogs’ sense of smell is not being engaged. Now this is a fertile idea: olfactory torpor. 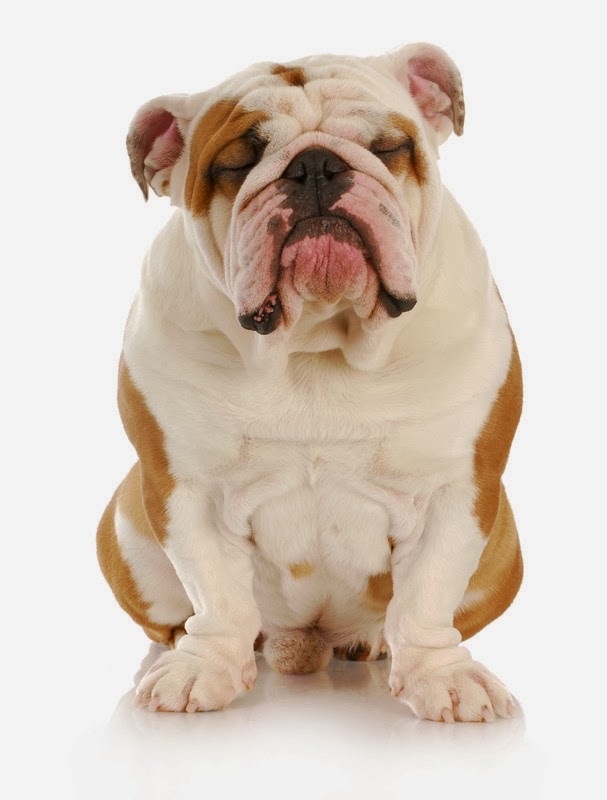 And while Amodio's article does not elaborate it, the idea bears intriguing implications: whether dogs’ sense of smell might atrophy given prolonged television watching, whether the sense of taste might be concomitantly compromised, whether inactivity would promote weight gain, muscle loss, lassitude; also, whether certain breeds are at greater risk, and whether conditions in the home and legacy of early puppyhood are precipitating factors –– whether, in sum, a relaxing pastime might under certain circumstances slide into dependency. Finally as regards treatment, there is this –– that in time we might see the emergence of self-help groups. Of all treatments, these would be best insofar as dogs themselves could take charge of their illness (“Hi, my name is Rufus and I’m a TV-holic”). 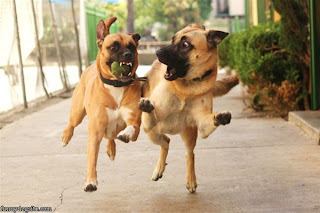 Regardless of treatment modality, the therapeutic goals with TV–dependent dogs would be the same: abstinence, amelioration of olfactory and perhaps gustatory deficits, and restoration of vigor and physical activity. 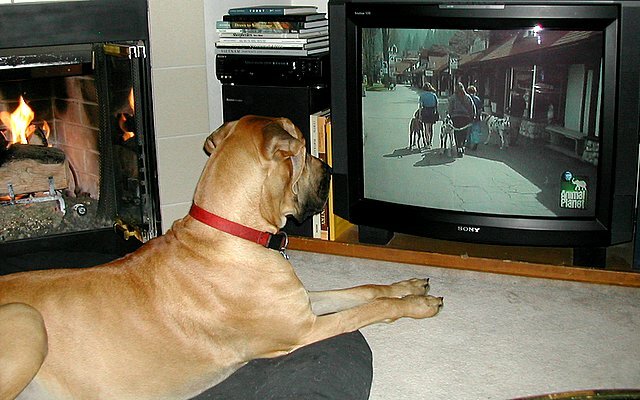 It seems I have emphasized dogs’ TV watching in a post that began with their music listening. 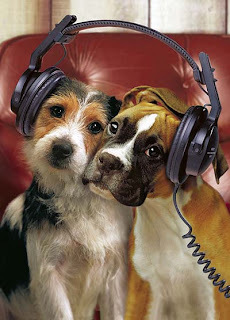 This is partly because the two experiences overlap, given that music permeates television via songs, jingles, background tracks, so that dogs are often watching and listening at the same time. But mostly I have stressed TV watching because of the worrisome possibility that dogs’ music listening could lead to the same sensory deficits experienced by TV-holic dogs. Meaning: over-involvement in the auditory sphere might predispose to music dependency, including the under-utilization of other senses, lethargy, and passivity which characterize TV-holic dogs. Jeff Daniels (Yes, that Jeff Daniels). You might hike the volume for this song, which is about a dog named Man and his owner, Jake. 5. “Feed Jake” (2007), Stear: a cover of a 1991 song by Pirates of the Mississippi. remarkable juxtaposition of Cher with an Afghan dog. 7. “Shambala” (1973), Three Dog Night: A song having absolutely nothing to do with dogs, but my layout editor, Todd, is adamant that it belongs here. 8. “An Old Dog’s Song” (2004), Kirk Olsen: from a children’s album, but with crossover appeal for grownups. 9. “Old Dog Blue” (1928), Jim Jackson: A 1928 version by Jackson, this venerable song about a beloved coonhound was old then. The last line pictures Blue up in heaven: he is treeing a possum in Noah's Ark. 10. “Old Blue” (1961), Joan Baez: the first version I knew. 11. “Old Blue” (1963), Ian & Sylvia: also great. 12. “Old Blue” (1980), Dave Van Ronk: also great. 13. “Old Dog” (1977), Mike Aldridge & Old Dog: My favorite dog song, from an out-of-print vinyl album on Flying Fish Records; Phil Rosenthal does the vocal. This is the second in a series of occasional posts to feature happy songs. 2. “I’m In Love Again” (1956), Fats Domino, the B-side of "Blueberry Hill"
One of Wallace Stevens’ last poems, “A Clear Day And No Memories” was composed in January, 1955. Stevens died that August. And it flows over us without meanings. So that this perception is actually an unfocused and passive reception. This state which Stevens describes and evokes is extra-ordinary, numinous –– analogous perhaps to a newborn’s primary experience of being, in which no identifiable thing is and yet everything is. The two oxymorons, “shallow spectacle” and “invisible activity,” suggest such a state, in which a sensory parade of stimuli (color, light, sound, motion) is not shaped by mind into familiar objects with distinct features; as if, to speak digitally, pixels fail to emerge as familiar forms. A lot "flows over us,” but nothing stands out and there is no felt meaning-making. Put differently, because mind is not parsing experience, there is a collapse of separation between perceiving subject and perceived object, between “I” and its world (image, thought, memory). This allows an openness to and acceptance of whatever comes into mind, like the experience of reverie or daydream, in which thoughts, images, urges float into and out of consciousness. Mind has stopped editing; ego is on hold, has left its desk; outside and inside are fluid. In the same way that Stevens' “sense” is "not part of the weather," so too does Merwin’s “something” appear once the clouds and murk of a storm have been blown away, as if this something required a blank screen in order to become manifest. For Merwin this experience is felt as a grace for which he is thankful; it has the quality of revelation. For both poets, this extra-ordinary state is a “just now” zone, detached from time and personal history. Both men receive unexpected and intense impressions. A tingle of awed discovery informs the poems, and clear air and clearing skies are precursors to altered perception, a charged present, expanding horizons. Central here is the idea of separation, or its lack. Merwin’s something has nothing of the objective reality of, say, Stevens’ young women “Bending in blue dresses” in the first stanza of “A Clear Day And No Memories." The object world is indistinct in both Merwin’s poem and the second stanza of Stevens’ –– and the numinous state is one in which perceiver and perceived are not separate. On the page Mr. Merwin's poems are ... instantly recognizable. Finally, “A Clear Day And No Memories” and “Just Now” show an ironic combination of detachment and immediacy, a combination familiar to contemplatives from different spiritual and philosophical persuasions. When not attached to, not “nailed” to life’s weathers –– memories, thoughts, diverse ephemera –– we stop holding our breath; we release, breathe more easily, slip into a “now” place, become more aware of a permeating flow of impressions. A rhythm of ongoing communion replaces a separate studious self. This borders on mysticism. 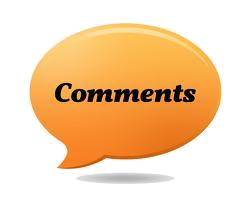 These poems resonate but are not easy to explicate –– almost by definition, since their subject matter concerns sensory and intuitive apprehension, not logical comprehension. Stevens has a “sense” of a deeper reality, and it “seems” to Merwin that this is also the case, but neither of them knows with (or is interested in) factual certainty. reflection, he finds himself and all other reality together.